Carlton batsman Fraser Watts praised the way the young players in his team handled the situation on Saturday as they battled hard to defeat Watsonians in the CSL Eastern Premiership. Carlton won at Myreside by 44 runs, but that does not tell the full story of an engrossing afternoon. Batting first Carlton had looked in a bit of trouble when they were 137-6 from 33 overs, but former Scotland man Watts stood firm, ending up on 78 not out, as the visitors made it up to 242-8 from their 50 overs. Teenager Olly Brown chipped in with a solid 36 on debut while Andrew Chalmers took four wickets for the home side. In Watsonians’ reply they were 198 all out, all of the Carlton bowlers chipping in. Brendan O’Connell made 37 for Watsonians and Andy Learmonth and Andrew Chalmers hit 34 each, but nobody went on to make a big score which has been a failing this summer. When they came to the boundary edge at the end of the match Carlton’s players were given extra reason to be cheerful with the news that leaders Mazars Grange had lost to Falkland. Watts said: “We knew that it would be a tough game against Watsonians, but I think the team put in a pretty good performance. “We knew that with Scotland players Preston Mommsen and Ali Evans missing others would have to step up to the mark and I think guys did that. “After we lost a few wickets my plan was just to stay in and remain unbeaten and let other guys come in and play some shots around me. It seemed to work quite well and I was impressed by Olly Brown, he could have been nervous coming into bat in a match like this, but he seemed pretty composed. “I felt that 242 was perhaps a few runs short of what we might have wanted, but the team fielded really well and did not give Watsonians any cheap runs and that allowed us to put pressure on. Grange missed a chance and lost their first league match of the summer. Falkland batted first and made 189 all out, young spinner Haris Aslam taking four wickets for Grange. Tom Foulds and Ryan Flannigan were out early in Grange’s reply and although young talent Fin McCreath made 34 nobody went on to a half century and they were 153 all out. Heriot’s and RH Corstorphine also lost home matches on Saturday. A superb century at Goldenacre by Hayes Van der Berg helped Aberdeenshire post a daunting 280-5 batting first. Charlie MacLeod led the way with 46 in reply, but in the end Heriot’s were 197 all out. 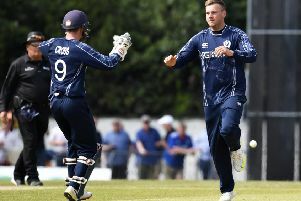 Jake Marnie’s 62 at Inverleith helped RH Corstorphine make 174 all out against Autoecosse Forfarshire but an unbeaten 116 from former Scotland skipper Ryan Watson drove the visitors home by six wickets. In the Baillie Gifford ESCA Championship, Carlton II pushed leaders Glenrothes hard at home, but lost out. The hosts were 156 all out, but Carlton were all out for 139 in reply. Kashif Parvez hit 97 not out to lead Holy Cross to a 31 run win over SMRH while Marchmont defeated Stuart&Stuart Penicuik with a cracking run chase led by Matt Loeffen.